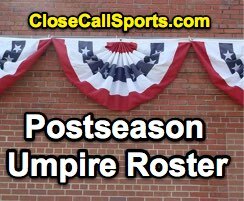 The 2018 American and National League (AL/NL) Wild Card Game and Division Series (ALDS/NLDS) umpire roster is as follows, sorted by round and crew assignment. The Replay Official does not join on-field umpires for MLB's first two postseason rounds. NL and AL Wild Card Game Replay Officials: Ed Hickox (8) and Sam Holbrook* (85). ALDS/NLDS Replay Officials: Marvin Hudson (32), Brian Knight (6), David Rackley (32), and Bill Welke (8). -cc denotes Game/Series Crew Chief, * denotes regular season crew chief, ^1st^ denotes first postseason assignment, '1st DS' denotes first Division Series assignment. Pursuant to UEFL Rule 4-3-c, umpires selected to appear in the Wild Card games receive one bonus point for this appearance, while umpiers assigned to the Division Series receive two points for an on-field appearance. Postseason crew chiefs receive an additional bonus point, but replay officials who do not appear on the field (e.g., Wild Card & Division Series replay personnel) do not receive points for this role.